At the close of 2014, Brita and Stephen Curry announced that Curry has signed a three-year deal with Brita to endorse the brand’s water filtration products and the benefits of water in general. The partnership would lead to Curry starring in a series of national ads, P.R. events and social media campaigns targeted at encouraging adults and kids in particular to choose water over sugar-laden sports drinks and soda. A 2013 study in the Journal of Pediatrics showed 80 percent of the food endorsed by athletes was “energy dense and nutrient poor,” while 93 percent of beverages endorsed got 100 percent of their calories from added sugar. It was a game-changing moment - having Steph Curry put the full force of his celebrity behind a campaign to encourage his fans and followers to make healthier choices. 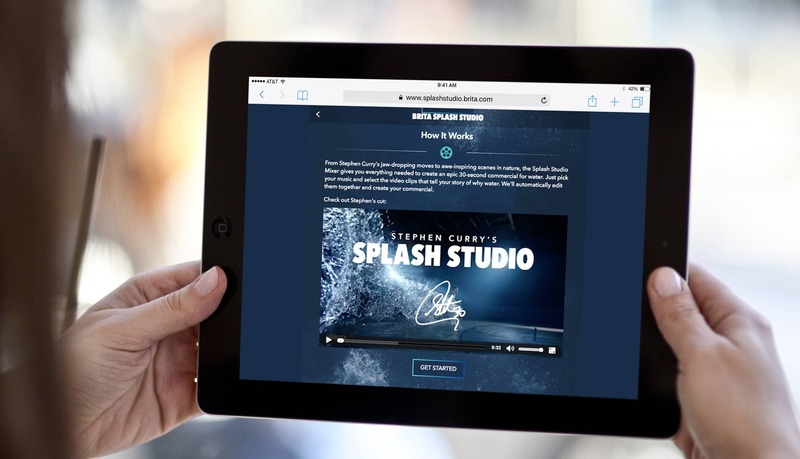 In January of 2015, I joined the team at Swirl to design the Splash Studio contest, the first of several campaigns to be led by Brita and Steph Curry seeking to educate and engage users in promoting water as the healthiest choice over all other beverages. 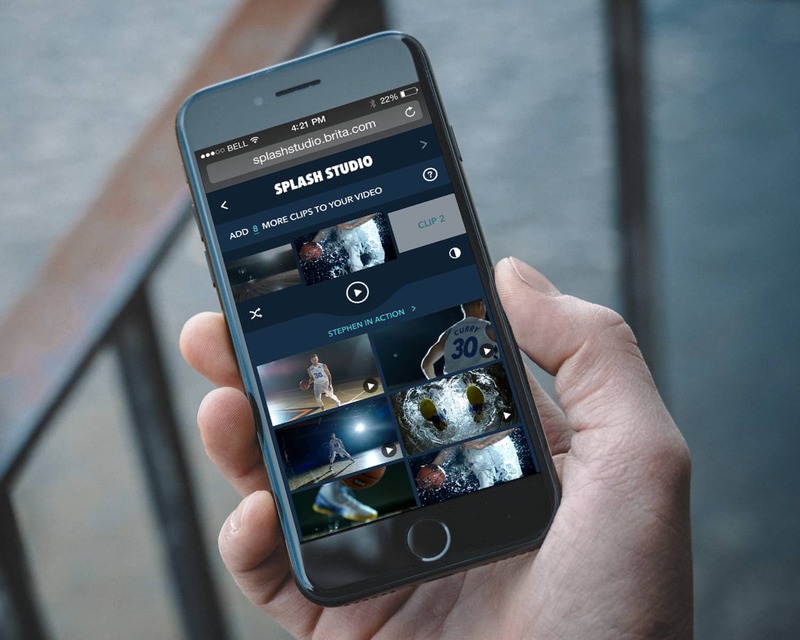 The idea behind the Splash Studio was to engage a wide audience - sports fans, health advocates, schools, film makers, and kids - by challenging them to create and submit an original commercial selling the benefits of water. The creator of the winning video would receive $25,000 and the chance to recreate the advertisement with a cameo from Curry himself. Brita would then air the commercial on TV at the start of the 2016-2017 basketball season. Brita's goals in launching the campaign were to create excitement and engagement around Steph Curry's endorsement, to have Curry maximize his influence in elevating "water" as a top beverage choice, to increase positive social chatter around water in Brita's third year of partnership with Drink Up, and finally to make hydration and water a popular topic of conversation in the mainstream media and social channels - beyond the confines of health organizations and influencers. 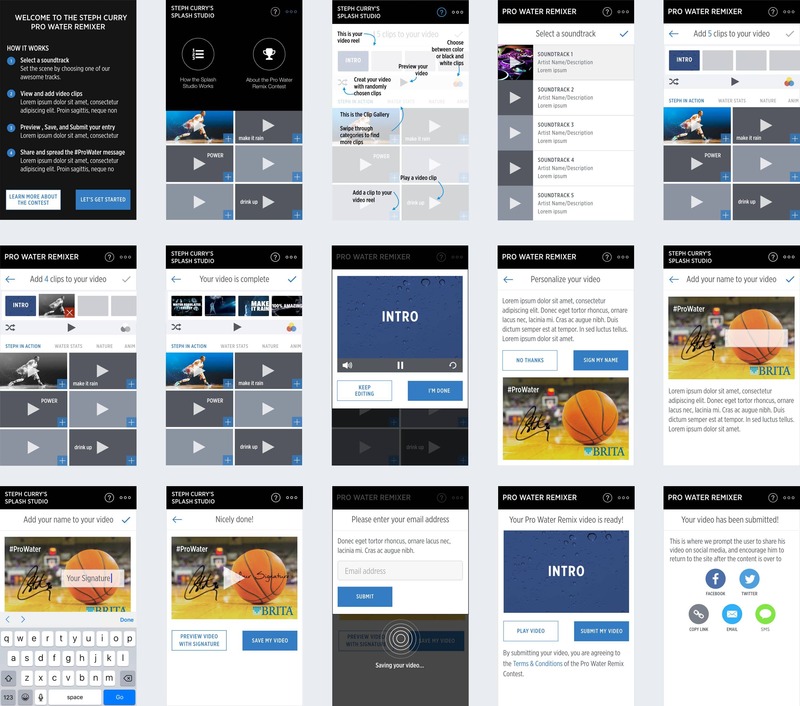 Our challenge was to quickly design a micro-site that would explain the contest rules, enable users to either submit a video created on their own, or to create and submit one online with the Splash Studio video mixer, which would be designed to allow users to choose short video clips of Steph Curry, water, and water-related stats to create their video montage. As I delved into the details of what this 2-pronged approach would entail, I quickly saw that there were several safeguards we needed to build in so as to avoid misuse. 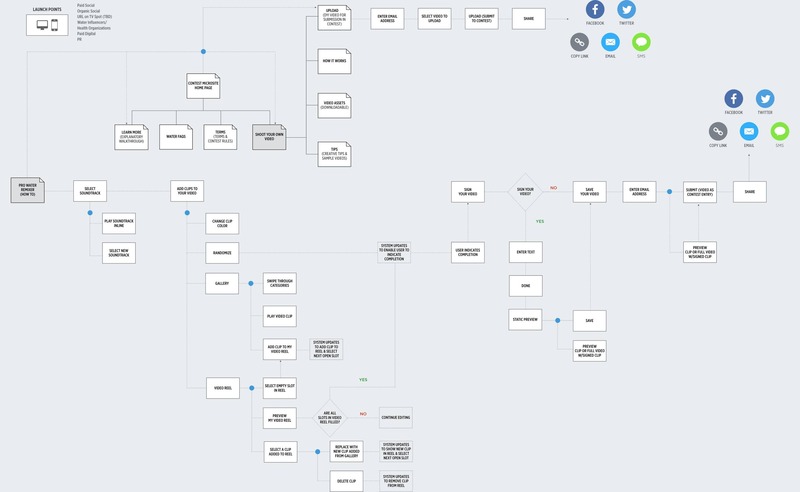 Through several iterations, I worked through the possible flows together with Swirl Creative Director and Technical Directors to define a balance between preventing users from creating and publicly submitting lewd, unsanctioned, and otherwise off-brand videos and avoiding seeming so restrictive and limiting as to prompt abandonment. Once the high-level process flow was solidified, I moved on to design all screens and interactions for suer task flows within the full campaign site, covering instructions and help, online video creation and submission via the video mixer, offline creation and online submission, as well as the post-submission process by which users could check the status of their video and view other submissions. 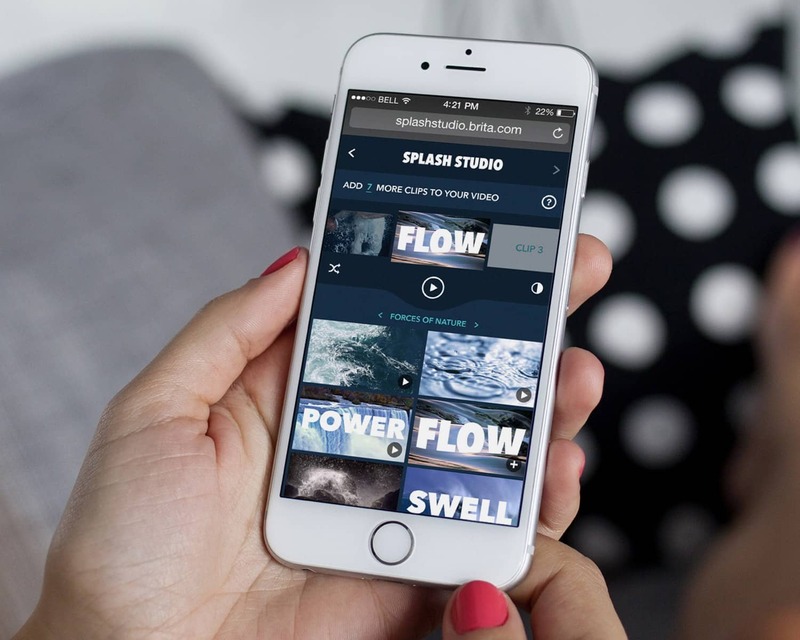 The Online Video Mixer provided the greatest challenge, and required close, iterative collaboration between Swirl's Creative Director, Technical Director, and myself in order to ensure that the final experience we were designing could actually be delivered. I mocked up a variety of video mixer feature concepts - choice of soundtracks, options to "sign" the video and enter customizable text onto a clip - that were unfortunately abandoned as unfeasible given the timeframe and technical resources available. The creation and release of the Brita Splash Studio was a well organized effort between Swirl, Brita, and other ad agencies. The talented Cara Mia Tontodonato created the stunning studio visual design, while a team of in-house and contract filmmakers and animators created promotional videos and video content used within the Online Video Mixer and the campaign, together with print and media ads produced by other agenices. Promotional efforts by Brita included Steph Curry and First Lady Michelle Obama appearing on Ellen to share the message, spots on Access Hollywood, and social endorsements from a host of hand-picked celebrities - all driving user engagement and social buzz around the Splash Studio contest. In late October, Brita unveiled the Splash Studio winner and final cut in a preview on Access Hollywood, then released the full ad on NBA TV, Brita's social channels and Steph's Twitter. 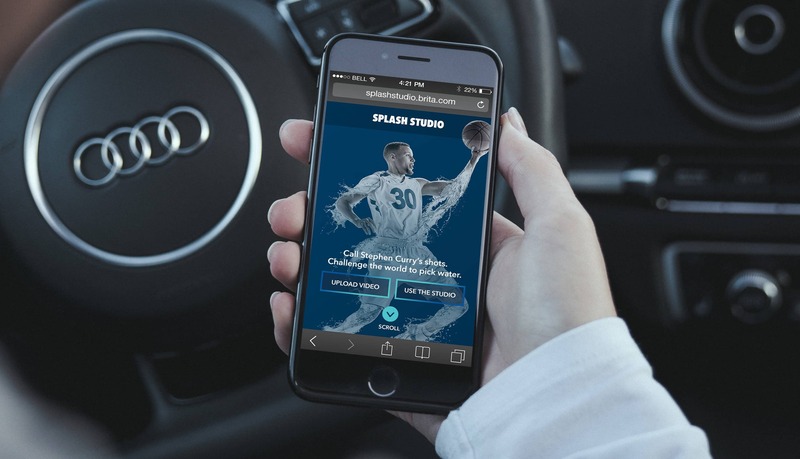 Brita's stats on the impact of Steph Curry's Splash Studio were dramatic. Promoted and increased positive social chatter around water by 12% in Brita's third year of partnership with Drink Up. Social buzz generated from partnership announcement coverage — including a tweet from First Lady Michelle Obama touting Curry's healthy choice in sponsoring water — generated 70.9MM social impressions. Curry's tweet with the final Splash Studios spot garnered 1.6K shares and 6.9K likes. Influencer support produced 33 pieces of original content, driving more than 20,000 visits to Splash Studio and nearly 2,000 content shares. Coverage around Brita's partnership with Curry and Drink Up efforts garnered 318MM+ media impressions from a mix of news, sports, local and entertainment outlets across broadcast, print and digital, including key placements on Mashable, Associated Press, Yahoo!, CBS Sports, and NPR's Marketplace. Social sharing totalled 70.9MM impressions from celebrity, fan and media accounts. Made hydration and water a topic of conversation outside the confines of health outlets and influencers with mainstream media garnering 110MM impressions.